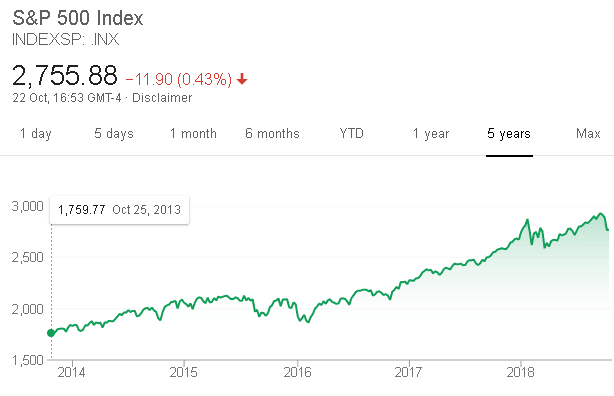 October is, historically, a unique month for the stock market. Not only is it earnings season, in which all of the world is watching reports, released by the economy’s largest corporations, giving us clues as to their health and to their future guidance, but it is also the month of historical “end of the world” events. October is also the most volatile month of the year, as measured by the standard deviation for the major indexes. Looking at every October, starting in 1896, when the Dow Jones was created, the standard deviation of the daily changes has been 1.44%. That compares with 1.05% for all months other than October. In other words, this month is 1.37-times more volatile. As you can see, over the past five years, these brief periods, when sellers overwhelmed buyers, have all been buying opportunities, in hindsight. In fact, EVERY dip in U.S. market history, going back over 150 years, has been a buying opportunity – we are sitting at all-time highs, after all. Buying the dips has been so automatic and so profitable, though, that it became synonymous with complacency. In other words, contrarians, in their attempt to prove that doing the opposite always works (a clear paradox), have ridiculed “the herd” for getting into stocks, after corrections. Well, they have been wrong, and by the looks of what’s about to happen, being out of the market seems like a dumb move. Just as surely as you know that a bear market follows a bull market, investors are also aware that the bulls finish their cycle with intense euphoria, and that the mainstream media releases tutorials on “How To Buy Apple Shares Before It’s Too Late,” but this isn’t a prevailing mood of the investment community today at all. Regarding valuations, stocks, cyclically adjusted, will become relatively cheap again, once the 2008 earnings are eliminated from the equation. In other words, the CAPE ratio, developed by Robert Shiller, refines the P/E ratios charts, by averaging-out 10-yr periods. So, as we enter 2019, the abnormal 2008 season, will no longer be a part of the cycle, which will cause P/E ratios to drop from 31.1 today back towards the 20,00 range. Without suffering for any severe correction, stocks, then, are about to become much more attractive, since the P/E ratio, averaged on a 10-yr period, will get a 33% discount. RSI (Relative Strength Index) was pushed into “extreme oversold” territory last week, which is rare and historically happens before massive rallies. The S&P 500 closed nearly four standard deviations below its 50-DMA last week, which only occurred once every 10 years or so and ALWAYS marks an important bottom. During the last, major bull market, which ended with insane valuations in March of 2000, market action in the 2-yr period, which came before the top, 1998 and 1999, included five stormy corrections, which caused investors to do serious gut checks. During earnings season, companies cannot buy back shares, which have been a critical source of volume, bidding-up share prices, over the course of this bull market. Wealth Research Group anticipates the bottom to be set in the coming days and weeks. The bull market ends when CNBC runs articles about “Sheer Greatness Exhibited by America’s Stock Market,” not like their headlines last week, which were: “Markets Turbulance, Be Cautious,” which is indicative of bottoms, not tops. One thing is for sure; volatility is back.